Ariel Smith* was born in 1995 in Afghanistan. Her mother was a teenager — her father not much older. He was skilled and worked as a photographer, a doctor, an engineer and a journalist. After three years, however, Ariel’s younger brother was born and their family grew. They needed food and her father needed a good job. She said they were starving. One day an American man came to Ariel’s father’s shop and told him that he would help him learn English. Ariel’s father was able to find a good job, and in 2005, applied for a visa. Dec. 17, 2013, was the day Ariel said her life was forever changed. It was the day she came to the United States. When asked, she used one word to describe that day. Ariel’s story is not uncommon. It is one of millions who seek refuge in the aftermath of global crises that have forced Afghanis and Syrians to find a home away from home. Glocally Connected, a nonprofit organization located in Riverside, is doing its part to aid refugees seeking community and a chance to start new lives in the Inland Empire region. The organization originally started as a summer English day camp run by Dr. Amy Stumpf, professor of society and religion at California Baptist University, but has since expanded to a weekly class where culturally diverse women from Corona, Moreno Valley, Riverside and other places in the Inland Empire can come and learn how to establish roots in their communities. It first began in the summer of 2015, when Stumpf had a break from teaching and was able to get the English camp off the ground. With the help of Karen Shade, professor in the computing, software and data sciences department at CBU, Stumpf’s mother and a couple student volunteers, Stumpf was able to provide a handful of local women, mostly from Afghanistan, with a daily English class that ran from May until August at Shade’s husband’s church, Palm Baptist, in Riverside. Even after the camp ended, however, Stumpf said the women still tried to continue learning in their homes. Stumpf met Nielsen and her co-founder, Sherry MacKay, in December 2015. Both women had experience working with refugees, along with more structure and framework based on past experiences they had with teaching English as a second language. “We have started in a small way trying to make a difference in these women’s lives,” Nielsen said. 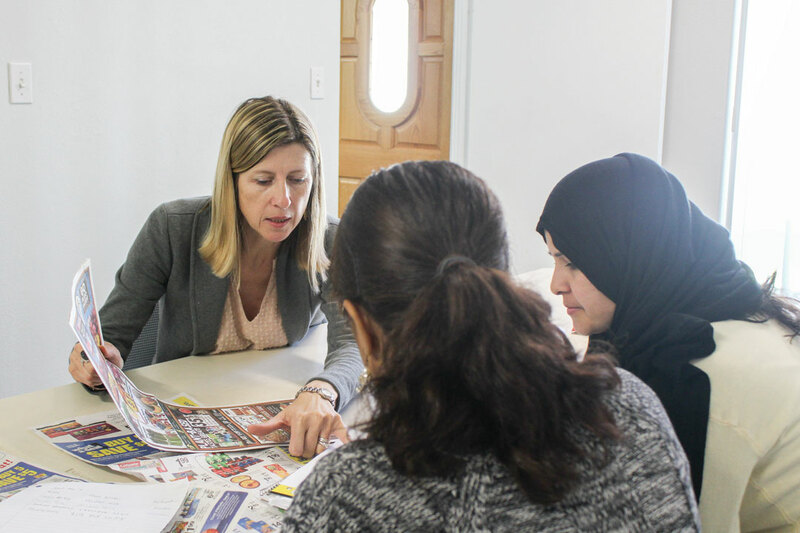 Through the classes, which are now every Wednesday and Thursday mornings at Palm Baptist, they teach the women English so they will be able to do things like go to the grocery store and buy food, or even pass driving tests in order to get their licenses. According to Stumpf and Nielsen, however, Glocally Connected is in need of volunteers, mainly with transportation to classes. Ultimately, she said they would like to expand to their own space and also have volunteers help out with teaching. Stumpf said a large part of what they do is not only providing resources for the women, but also caring and showing genuine love for them and their families. For those interested in volunteering or donating, contact Nielsen or MacKay through www.glocallyconnected.com/ take-action. Contact information is also available through the website. Stumpf encouraged those in the community to join in the effort.